This electronic R2-D2 figure is a one-of-a-kind design concept from the tail end of the Star Wars action figure line. 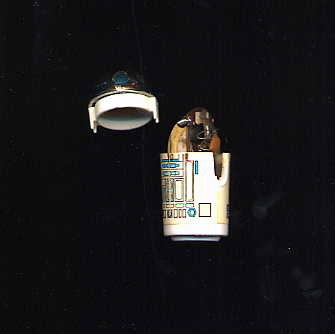 R2 was wired to make electronic sounds, a feature that would be absent from the vintage Star Wars action figure line. Although this concept never went into production, it is a unique glimpse at "what could have been" added to the Star Wars figure line. This dissembled view shows the circuitry that was added to the regular action figure. The circuit slid vertically down the main column of the figure. Note the thin slits in the main section.